The underlying premise of the Liberty Academy is that all humans are born free and remain so throughout our lives, no matter what anyone else may say or do to us. As humans, we are born on this amazingly diverse and stunningly beautiful planet - which seen from space has no borders and appears totally serene. National borders and countless other social constructs (such as political systems, governments, unjust laws, rules, standardized education systems, and so on) have largely contributed to the shackling of humanity and free will. The fundamental principle of liberty is exactly that - freewill. It's the gift we are born with that allows us to make up our own minds. The key thread or primary meaning of the term is that we are free and not under the rule of others and thus masters of our own destinies. Yet throughout history, many have gone to great means to impose their own will, rules, or unjust laws unto others. Part of being truly free is both recognizing and rejecting such forms of tyranny or oppresion and empowering oneself to discard them. There are several means by which we can empower ourselves in this regard. Education is certainly one of them. Sadly, most individuals have forgotten the simplest one of all - which is simply to exercise the innate natural right they are born with. Another means is what we call to unlearn or unschool yourself. Standardized education has been purposefully designed to lead people to believe that they do not have free will and must follow or obey even very unjust rules or laws, otherwise they may suffer consequences. Part of what we want to accomplish at the Liberty Academy is to remove those harmful layers that have inhibited and deprived you for so long so you can get back to a free, happy, healthy and enriching life. Even though this is more difficult for adults to do so, it is never too late to learn how to learn anew. For children & teens in particular, they usually still have these innate qualities of questioning and creativity bubbling in them and are thirsty for self-expression - something that can be very challenging in traditional educational settings. The variety of courses and mini-courses offerred at the Liberty Academy will provide the means by which anyone can further enrich themsevles through an enlightening journey of exploration, self-discovery, and with the acquisition of a broad set of skills and abilities, not excluding a rich breadth and mix of knowledge from various fields ranging from philosophy to photography. Lastly, we believe that investing one's own time and energy ought to be rewarded and thus are implementing a program of cryptocurrency rewards for students, teachers, and contributors. To empower all human beings with the skills, knowledge, and abilities to pursue a life filled with freedom and self-sufficiency. I have chosen a hummingbird called a violet sabrewing (Campylopterus hemileucurus) to represent the essence of the academy. Why? Many reasons. Firstly, it is a stunningly exquisite and vibrant creature that gracefully exudes its pride and freedom at all times. Next, it is guided by nothing other than its natural instincts, flying where it wants to and when it wants to. It represents total freedom. Self-sustainability is another important attribute of this majestic bird. It can re-fuel and feed when it wants, doing so with its own free will and intelligence. Simply put, we could not survive as a species on this planet without animals and nature; but they could easily do so without us! Although we arrogantly see ourselves as the superior species on this planet, we are far from it and have yet so much more to learn from animals and nature itself. Many of the greatest philosophers sought to understand nature better, as if we do we can better understand ourselves. 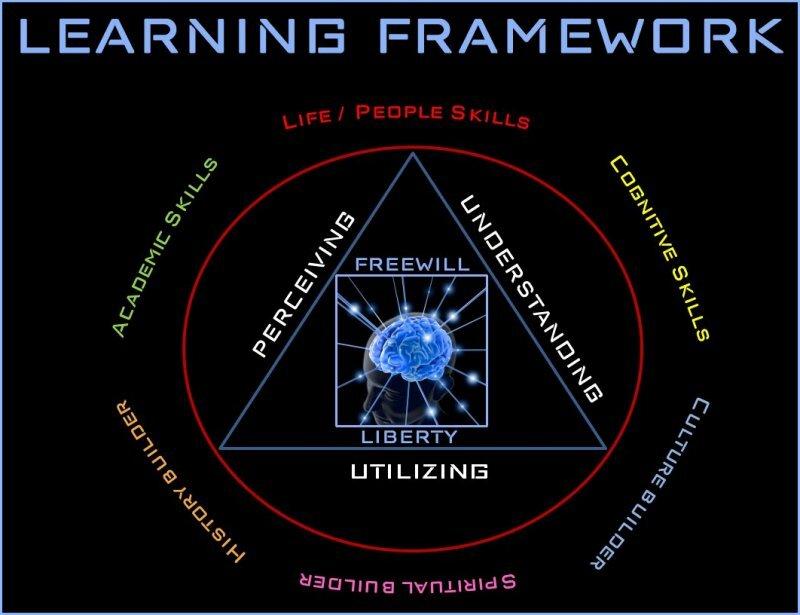 In line with our mission and the underlying principles of liberty (as stated above), our learning framework or philosophy is based upon these core fundamentals. We believe that a return to a classical approach provides a more effective means of learning. We not only forget the wisdom of the ancients and their great civilizations, but also the means by which they attained their wisdom. The Ancient Greeks and their great philosophers spent a great deal of time pondering the best methods to gain an understanding of our natural world and also to question the nature of truth itself. For without truth, how can we really learn about reality? Acquiring a more thorough understanding of reality consists of: perceiving that reality (through our senses), understanding or making sense of it, and wisely utilizing or acting upon it. For centuries, this three-step method has been referred to as The Trivium and has been used as an effective model for learning. One course we offer – The Trivium: Learning how to Learn – goes over the model in great detail and we encourage all to take that course as a foundation, no matter what subjects you like to study. To complement the classical approach / Trivium model, we also believe that the following groups or categories of learning sets will provide for an even more comprehensive framework of learning. And will thus enable students to diversify their KSAs (Knowledge, Skills, & Abilities) more broadly in order to be more discerning and critical of the complex and dynamic world we live in. The Liberty Academy is the brainchild of Dan Fournier. He has been working in the educational sector for over 30 years (since 1987) spending more than 20 of them (since 1999) as a teacher, instructor, mentor, coach and trainer. In Canada Dan taught both computer science and business at the collegiate level in the province of Québec. Since 2008, Dan has been teaching a wide variety of subjects to both middle- and high-school level students as well as to adults in the corporate sector in the fascinating country that is China. He intends to keep teaching, as it is one of his main passions. And is thus the reason he wanted to launch the academy, giving the opportunity for anyone to share and grow.